Finally got some pictures for you guys. This is my work/hobby desk in my room. It's still a mess, but it's the cleanest it has been since I had to move my room around. The drawer units on the right is my bits box, all of my extra pieces from old kits are kept there so I can "kit bash" my Space Marines to make them more unique. Vallejo and Citadel paints are kept on the desk in the organizers, base paints on the far right, layer paints in the middle and washes/glazes on the far left. Minitaire airbrush paints are kept on the wall so I can organize and order more paint at a glance. Unbuilt kits (bags and clamshells, usually characters or 1-model units) and tools are also on the wall. Here are a few WIPs that I've been working on and off with over the last few months... A Deathwatch Librarian from the Blood Angels Chapter. The Deathwatch hunt aliens throughout the galaxy, searching for infestations of Tyranids or securing Tau and Eldar technology for the techpriests of Mars. A bare head I've been working on for a squad's Sergeant model. Need to give him another coat of wash and highlight to sharpen the detail, but heads are so tiny. Yes, I have him pinned to a wine bottle cork while I paint him. I don't use magnifying glasses, by the way. They're annoying and get in the way. Last one for a bit. A Deathwatch Vanguard Veteran from the Crimson Fists chapter. This is one of the more recent miniatures I've been working on. Armor needs washing and highlighting. I have more pictures somewhere on my hard drive from a while ago. Let me know if you guys wanna see more. My order from Games Workshop with new miniatures should be coming in sometime mid-week along with new paints for me to try out. I know how that feels. I have people and a community I can play with, but no time to play. I've been trying to teach a buddy of mine how to play using Tabletop Simulator and Vassel because you can just save and walk away. It's hard to remember where you left off after a week or two though. Yeah... GW has this thing where they don't like people making money off their products. Shocker. Was nice to hear that though considering out zealous they get with the copywriting and stuff. They've C&D stupider things for stupider reasons. They probably decided not to C&D this BECAUSE of Ultramarine. That movie was all around horrible. Graphics and story (from a fluff perspective). 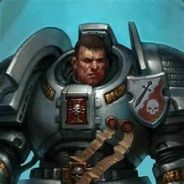 Alright guys, I've been a fan on Warhammer 40k for god knows how many years. My fandom began with the tabletop game. In my 10+ years of collecting and playing, I've amassed a large collection of several armies including but not limited to: Space Marines: - Iron Hands - Salamanders - Crimson Fists - Dark Angels - Blood Angels - Grey Knights - Deathwatch Astra Militarum (Imperial Guard of older fans): - Standard Astra Militarum - Militarum Tempestus Adeptus Mechanicus: - Cult Mechanicus - Skitarii Inquisition: - Inquisition - Officio Assassinorum and Tau Empire I just pre-ordered the new Triumvirate of the Primarch box because I want the new Cypher and Grand Master Voldus miniatures for my collection. A buddy of mine actually plays Ultramarines (and is stoked that Guilliman is back), and has agreed to let me paint the Primarch for his army. As the box isn't released until next weekend, I am curious if anyone would want to see my progress from base coat to final version on this or any of my miniatures? I hope that maybe getting some support here might lead me to getting my painting gloves back on and get cracking on my unpainted miniatures. I'm open to questions and critiques from anyone, I'll try and answer/respond between my two jobs. I've seen errors like this a long time ago when I was doing repairs for a living. If you are able to, you could try to reformat the drive on another computer and see if that does anything. Speed of repairs being most important to me at the time, the fastest way to get it fixed was to simply replace the hard drive. Assuming the old drive wasn't corrupt or damaged, I would then salvage as much data off the old drive as I could. I want this and I want this now. Has been forever since I've played OoT. Was just thinking about playing the Master Quest version again. I'm kind of all over the place for games. I'm excited for the Shadows of Mordor sequel, Shadows of War. Horizon Zero Dawn for PS4 looks good, though I don't own a PS4. I was excited for Ghost Recon: Wildlands until I got some hands on time during the open beta. Ghost Recon is going to need to make some significant changes to gameplay and optimizations before I would buy it. As a 40k fan, I'm definitely looking forward to Dawn of War 3, but probably not enough to buy it at launch. I have plenty of strategy games for PC at the moment. Need to find me some other good games to keep my attention for a while. 1. Cake is a lie. 2. No. 3. Thanks! It is a fantastic game. My problem is I'm not very good and I work 2 jobs, so time is always an issue. And I've had other games distracting me. I have. Used to play World of Warships with a small group of friends not too long ago. Maybe $100-$200 for premium account time and a few premium ships (US: Atlanta; USSR: Murmansk; German: Scharnhorst; and UK: Belfast). Haven't played for a while though. You too, huh? He's only been bothering me for years to sign up and be active here. Finally broke down. Will see how this goes. I finally broke down to Tucker's peer pressure and made an account after having lurked for so many years. I hope to get to know you guys and make some friends.